The Guardian posted an interesting story today about the conservative blog Libertas, which is claiming that it, along with other members of the "alternative media" such as radio blowhard Rush Limbaugh, brought down Robert Redford's decidedly left wing Lions for Lambs sight unseen, which resulted in its bombing at the box office. The claim is, of course, like many claims made by such people, patently insane. Not to mention jaw droppingly self important. As one of the film's few proponents, I still find it strange that the film was met with such harsh criticism. By the film's end we are left with no other choice than to ask ourselves where we stand and what we stand for. Few films have the power to inspire us, to wake us up to parts of ourselves we never knew or had forgotten about. 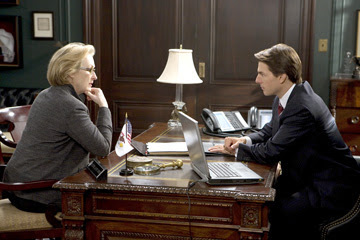 "Lions for Lambs" is one such film. It is a film with much to offer and much to contemplate. I for one was left reeling, moved beyond words. It shook me and left me wondering what it would take to get people's heads out of the sand and away from the escapism just for an hour and a half to see this movie. An hour and a half can change your life and maybe inspire someone to change the world. If a film, flaws and all, can have that kind of power, then it is a truly special work indeed. That's probably one of the most positive reviews you will read for Lions for Lambs. Which is sad, because people I have talked to who have seen it seem to have been genuinely moved by it. Lions For Lambs did everything it could to paint itself as a down-the-middle polemic both in its trailer and where it advertised. Many conservative websites have Lambs banner ads because Lambs clicked “conservative” in the “describe yourself” box to get on those sites. They also advertised for months during NFL football, probably the most heartland-watched and patriotic programming on television. In other words, they spent gajillions trying to get ahead of conservative critics to say, “No, we’re this!” But it didn’t work. First of all, what's so patriotic about football? "Oh let's go watch a bunch of men tackle each other and chase a ball around a field to show how much I love my country!" Nothing is more American than violence, apparently. Secondly, Lions for Lambs never tried to pass itself off as being neutral. Did they see the same trailers that I did? From what I saw it was very evident that it was going to be a liberal-minded, anti-war piece. And I live in staunchly red state, Bible belt country. However, from the trailers, I thought Tom Cruise was going to play his character as an evil, corrupt Republican caricature. But he didn't, his performance is much more layered than that. He plays Senator Irving as a man who truly believes he is doing the right thing for his country, but has become so hopelessly corrupted by politics and party loyalty that he can't see the damage he is doing. 1) Subject matter. All movies dealing with the Iraq/Afghanistan conflict have underperformed. Rendition didn't make much of an impact at the box office, and the powerful In the Valley of Elah disappeared without a trace. Americans have made it clear they would rather A) stick their head in the sand, B) go to the movies to escape rather than be reminded of our current situation, or C) stay home and watch this on CNN. 2) Americans are tired of Tom Cruise and his Scientology antics. While I sympathize with this, that doesn't affect how I watch his films. Some people apparently can't separate actors from their real world personas. 3) Advertising. The trailers make it look very talky...which it is. But mainstream audiences are not going to sit in on a film that is essentially a filmed series of debates and in-depth discussions, not matter how fascinating or thought provoking they may be. It's a sad series of factors, because Lions for Lambs really is a worthy, rewarding film, despite the critical ravaging it has recieved. It makes me wonder what they really have against it. There is a lot to chew on and contemplate in Redford's film. If you only take the time do so.